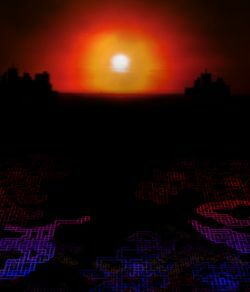 Hokkai over the horizon in Undefined Fantastic Object. Makai (魔界, lit. "Demon World") is a world that exists in essentially an alternate dimension to Gensokyo. According to the PC-98 canon, it, along with all the beings that live here, were created by Shinki. It is not to be confused with Hell (地獄, jigoku) as it is not a place for the afterlife when phantoms are judged by the yama for their guilt, but instead it is merely a place where demons and strong youkai live. 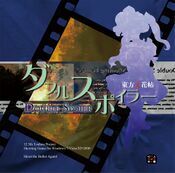 Makai's first initial appearance in the Touhou Project was in the first PC-98 game Highly Responsive to Prayers, where it is one of the main locations of the game. It then appeared as the prime location of Mystic Square, where the player character will have an adventure through here. After many years of absence, Makai once again made a return in the Windows era as the location of Stages 5 and 6 in Undefined Fantastic Object, and again a target location on Stages 7 and 12 in Double Spoiler. In the PC-98, the entrance to Makai is located in the mountains behind the Hakurei Shrine, called the "Cave in Which the Door to Makai is Said to Be" (魔界の扉があるといわれる洞窟, Makai no Tobira ga Aru to Iwa reru Dōkutsu, actual name), where Reimu Hakurei wondered if there's a way to open its door. Passing through here will lead you to a border between Makai and the Eastern Country, which it's rather easy to cross. However, it was once said by Genjii that the World of Fantasies is the border between the Eastern Country and Makai, and a portal appeared at the Hakurei Shrine in Highly Responsive to Prayers. Makai was shown to have many demons and even spirits, where it was said that everything within Makai (including the residents) was created by Shinki, the God of this world. It is filled with gloom and darkness, where flying through here can give the feeling of being outer space, but there are also extensive fields of crystalline forests and frozen fields. There appears to be no natural material such as flowers. Louise, a resident here, describes Makai as a "nice place". It is unknown how big Makai really is, but there is known to be an end at the Pandæmonium, the fortress of Shinki. In the Windows canon, Makai has a barrier that makes it difficult to immigrate across; the Palanquin Ship, Byakuren Hijiri and Nue Houjuu are the only known thus far to pass it. It is an unstable land with a harsh and unearthly nature that makes it difficult to survive in, but youkai and some humans live and/or train their powers here regardless. It is filled with a toxic miasma that's physically harmful that makes it impossible to get to Makai, but it strengthens magical spells and seals, and it can also make learning magic easier for a human. Apart from Byakuren formerly, no known character from the Windows era lives here. There is no history about this place, and it is unknown where it's located. Much of Makai's terrain is a deep red color. Various items also exists that cannot be found in Gensokyo, such as a magic stone, "Makai mushrooms", and a stand that sells "Makai crackers". Many materials in Makai contain their own will, an example being the materials Byakuren used to make her sutra scroll, which the scroll and other materials is considered "cursed" by the people of Gensokyo. Sakuya Izayoi suggests that Makai is scarier than Hell, and even Reimu Hakurei finds it creepy. It was mentioned that there's a sub-location called Hokkai that is, as Minamitsu Murasa puts it, in "a corner of the infinite area of Makai". No demons were actually presented in the modern era, but they were stated to live here. There are also dark-coloured fairies and sunflower fairies that lurk around in Makai that blend in to the dark scene, as well as flying yin-yangs. Marisa Kirisame has been given special permission to use Byakuren's Palanquin Ship to travel to and from Makai whenever she wants, but this has yet to happen. The Ruins of Vina (ヴィナの廃墟, Vina no Haikyo) is only seen in Makai route stages 11-15 of Highly Responsive to Prayers. Reimu Hakurei encounters Elis here on the fifteenth stage. Nothing else is known about this place other than its name. The Fallen Temple (堕ちたる神殿, Ochitaru Shinden) appears somewhere in Makai and it is the setting of stages 16-20 of Highly Responsive to Prayers where Sariel is. Nothing is known about it, but there appears to be a crucifix in the background. Makai City (魔界の街) is what appears to be a settlement for demons. It is the location of Stage 3 Mystic Square. There appears to be a diagonal brick path, which contain two signs that read "Romantic", then "Children!" Buildings that give the appearance of a city also appear on the Final Stage when fighting Shinki, and in Undefined Fantastic Object before encountering Byakuren Hijiri, as shown in the box on the right. World of Ice and Snow (氷雪世界, Hyousetu Sekai) appears on Stage 4 of Mystic Square where the heroine encounters Yuki and Mai who tried to prevent then from proceeding. It is a blue, frozen field that appears to have a river flowing through it, shown in a dark blue. Beyond here, there is Pandæmonium. Pandæmonium (パンデモニウム, Pandemoniumu, also Pandaemonium or Pandemonium) is the fortress of Shinki, the creator of Makai. It seems to be constructed from a sort of crystalline material. The player visits the fortress on Stage 5 and the Final Stage of the game. Although it's not confirmed that the Final Stage is Pandæmonium, Shinki states that "there is no 'next'" when confronting Marisa Kirisame, since she thought there'd be another area to go to if she defeated Shinki. Also, there appears to be the shape of the Rubin vase in the background of Stage 5. The Wonderland, implied to exist within Makai, is a part of Makai that's presumably created by Alice Margatroid. It's the setting of the Extra Stage of Mystic Square. Hokkai (法界, lit. 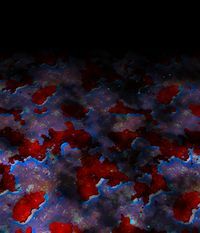 "Realm of Truth") is, as Minamitsu Murasa describes it, tucked away in "a corner of Makai" in Undefined Fantastic Object. Not much is actually known about it, but the heroine travels there in Stage 6 of Undefined Fantastic Object where the entire region appeared to have been tucked away with a strong seal, along with the monk Byakuren Hijiri. The Soaring Vault was used to break the seal, and it is not filled with miasma. On the floor above Hokkai on Stage 5, there seems to be bubbles coming out that would usually appear in lava. The name is also a Buddhist term that can translate to "dharmadhātu", which is suppose to be a realm of Dharma. It was described as the "The Red and Black Seal of Makai" on Stage 5. Makai first appeared Highly Responsive to Prayers and it is one of the main locations of the game. Reimu Hakurei discovered a portal that had opened in her shrine. A being from either here or Hell came and destroyed the Hakurei Shrine, so Reimu has to go out and put a stop to their reckless nature. After beating the boss SinGyoku on Stage 5, the player will then decide which route to take: Makai or Hell. If they chose Makai, then the rest of the game will occur through here. Stages 6-10 seem to take place at the Gate (ゲート, Geeto) to Makai, where the boss of Stage 10 is YuugenMagan. Once that enemy is defeated, Reimu shall now go through the Ruins of Vina on Stages 11-15. The Stage 15 boss is Elis, who can turn into a bat and will try and put a stop to Reimu. Once she is defeated, Reimu will spend the final 5 stages at the Fallen Temple, where she'll meet Sariel, the Final Boss, who must be defeated in order to clear the game. On Stage 3 when Reimu Hakurei and Genji are travelling through the World of Fantasies in Story of Eastern Wonderland, Genji references that they're on the border between Gensokyo and Makai. Stages 4 and 5 take place at Reimaden, but because of Genji's statement, it is unknown if the last two stages, or Reimaden itself, is part of Makai. Makai was entirely the centre of the main events of Mystic Square, because demons from this world were coming to Gensokyo in great numbers as tourists due to a tourist agency that organises their travels, which made Reimu Hakurei, Marisa Kirisame, Mima or Yuuka Kazami take a visit to Makai. Essentially, only Reimu goes to Makai for this very reason, whilst the other three will go for somewhat unrelated reasons, and thus do not resolve the actual incident. Although in Marisa's ending, she exterminates the demons. The heroine starts on Stage 1 that takes place at the "Cave in Which the Door to Makai is Said to Be", where they'll go through here fighting stage enemies, specifically the bakebake and demons. The Wheel Demon is the midboss, whilst Sara, the gatekeeper here, is the boss. The heroine will defeat them here and head towards Stage 2. Here, they'll fly through the border between the two worlds and fight unusual enemies. This midboss here is the Spirit Mirror, and the boss is Louise. Again they're both defeated, with the latter because she was heading for Gensokyo. Stage 3 is finally within Makai itself. The heroine will fly over Makai City fighting more demons and bakebake. Unusually, Rengeteki, the nameless fairy-like creature who originally appeared as the Stage 4 midboss of Lotus Land Story in Mugenkan, re-appears as the midboss here. It is not explained why she's in Makai, but she is still defeated regardless of the player (that includes Yuuka). At the end of the stage, Alice Margatroid will appear for the first time in the series, who tries to prevent the heroine from going deeper into Makai. When the battle starts, the background will change into a scenery with a forest, a river and some mountains, which are all apparently made of crystal. Alice was eventually defeated. The heroine will then progress onto Stage 4 at the World of Ice and Snow. On this long stage, red and blue windmills, as well as some other spirits and fairy-like demons will attack the player. It should be noted that blue-coloured windmills might be difficult to spot due to using the same colours as the background of the stage. A being that appears to be Louise will appear as the midboss of the stage, having a stronger attack. After more roaming, they'll encounter Yuki and Mai, who too tries to prevent the heroine from going any further. They're the boss of the stage, who'll attack as a duo. Sometime after their third phrase of danmaku, depending on who the player was shooting at, one of them will be defeated, and thus the other one will jump in and fight solo for the rest of the boss fight. Mai is considered easier to deal with than Yuki. Once one of these two are defeated, the heroine will move onto Stage 5. 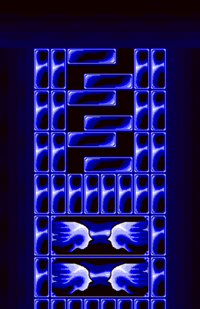 On Stage 5, the heroine will now fly over Pandæmonium, where demons are exclusively the only stage enemy here, and that they use the same sprite as the Wheel Demon. The midboss of this stage is Ayana, who is defeated, and thus the heroine will continue to roam and defeat more demons. Although, the stage can actually be skipped if you were to not defeat Ayana, where she'll be defeated by default before Shinki makes her cameo appearance on this stage. As Shinki was talking to the heroine, Yumeko will then jump in and interrupt their conversation and insists to fight the heroine, being the Stage 5 Boss. After she is defeated, the heroine will travel deeper into Pandæmonium and encounter Shinki, the Final Boss once more, where they'll discover that Shinki is the creator and ruler of Makai, and was also the one who let demons go to Gensoyko as tourist. The heroine will battle Shinki though a stages of phases in her danmaku that will change the background. One notable background is that there appears to be buildings on fire. Eventually, Shinki is defeated, and has stopped tourism to Gensokyo, although that doesn't seem to be the case in Reimu's ending. For little reason, the heroine will return here to the Wonderland on the Extra Stage, where they'll fight stronger windmills and card soldiers, where the card soldiers will be standing on a platform, shooting danmaku only downwards. The Trump King is the midboss, but was defeated. After some more roaming fighting enemies, they will encounter Alice, who is the Extra Stage Boss. She fights using nine phases, and after a hard battle, she is finally defeated. 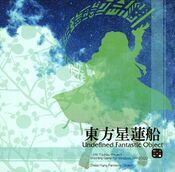 Makai makes a returning appearance on Stage 5 of Undefined Fantastic Object. After collecting Soaring Vaults disguised as Seed of Unknown Forms, the heroine ended up being part of the youkai group who are trying to free Byakuren Hijiri, thus travelling to Makai via the Palanquin Ship captained by Minamitsu Murasa. Once the ship lands in Makai, it runs out of fuel. The heroine then has to roam above Hokkai, fighting Makai-type fairies and sunflower fairies, as well as dodging the obstacles created by the flying yin-yangs. Nazrin will re-appear as the midboss of the stage, surprised that they managed to make it to Makai. She tests the Jeweled Pagoda of Bishamonten on the heroine before giving it to her master, to which she was defeated and flees once again. Off-screen, she meets with her master and gives her the pagoda. Once the heroine has done more roaming, they'll encounter Shou Toramaru, Nazrin's master. The heroines want to fight her simply because she's a youkai, to which she was defeated. After, the heroine will then break the seal to Hokkai with the Seed of Unknown Forms that they've been collection out of pure curiosity. After the seal is broken, they'll enter Hokkai, the Final Stage. They'll face more fairies, where they seem to give an obvious reference to Space Invaders as they slowly fly down the screen. Then, Byakuren will appear, finally free thanks to the heroine. However, they discover that she is friend to all youkai, even though she wants equality with both youkai and humans, and thus they both go into battle, with Byakuren being the Final Boss. Once the heroine wins, it is implied that everyone leaves Makai thanks to Byakuren. In all the Bad endings, if the player got a continue whilst playing the game, the heroine will be trapped in Makai, trying to escape being their top priority. Makai appears in Double Spoiler on stages 7 and 12, with the latter stage specifically in Hokkai. On Stage 7, Aya Shameimaru and Hatate Himekaidou encounters Shou Toramaru and Nazrin to try and take photos of their danmaku. There are 7 scenes total on this stage. The previous stage is at the Former Capital in Former Hell of the Underworld, whilst the next stage is at the Remains of the Blazing Hell back in the Underworld. On Stage 12, Aya and Hatate encounters Byakuren Hijiri and Nue Houjuu to try and take photos of their danmaku. There are 8 scenes total on this stage. The previous stage is at the Wind God's Lake on the Youkai Mountain, whilst the next stage is at the Road of Lingering Snow on the Extra Stage. It is not explained why all these characters came back to Makai, and how Aya and Hatate managed to pass Makai's strong barrier. 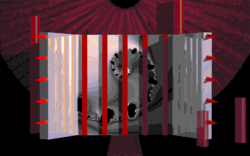 Another part of Pandæmonium, as seen in Mystic Square's Final stage. Makai on fire, as seen in Mystic Square's Final stage. A part of the Wonderland, as seen in Mystic Square's Extra stage. There is a major inconsistency on what is the "true" entrance to Makai, or if there are multiple ways to enter it, even across the PC-98 era. Firstly, there is a portal that leads to the gate to the Ruins of Vina in Highly Responsive to Prayers. Secondly on Stage 1 of Mystic Square, there is the "Cave in Which the Door to Makai is Said to Be" that leads to the border between Makai and Gensokyo. Thirdly on Stage 3 of Story of Eastern Wonderland, the World of Fantasies is said by Genji to be the border between the two worlds. Lastly in Reimu's Ending of Mystic Square, a portal appears in front of the Hakurei Shrine that seems to come from Makai. It is unknown if any of these connect to each other. Additionally, the Palanquin Ship was used to pass over into Makai in Undefined Fantastic Object in an unknown way. Alice Margatroid was a resident of Makai during the PC-98 era. Due to Alice living in the Forest of Magic in the Windows era and being stated to be a magician who was formerly human however, there is an inconsistency. Shinki is known to have created everything, but it's unclear if this includes Alice. However, she does refer to Reimu Hakurei as a "human", implying that she isn't. It's unclear whether Alice was created by Shinki, was a normal magician who moved to Makai, or if her origins have been retconned by the Windows games. Additionally, even though Shinki created everything in Makai, it is not entirely stated that this is also true for the Ruins of Vina, Fallen Temple, YuugenMagan, Elis and/or Sariel in Highly Responsive to Prayers and, as already indicated, the Windows era. Makai made its first post-PC-98 appearance in Undefined Fantastic Object, but none of its known residents were seen during the game. However, various "PC-98" references was shown in within the Windows canon, such as fairies having their wings coloured similar to Shinki's and that Byakuren Hijiri has this spell card that's similar to one of Shinki's attacks. These dark-coloured fairies are still presented in the Touhou Project as of Legacy of Lunatic Kingdom. The buildings seen over the horizon on Stage 6 of Undefined Fantastic Object seem to also reference one of Shinki's background attacks. As Makai returned from the PC-98 in Undefined Fantastic Object, both Reimu Hakurei and Marisa Kirisame appeared to be surprised when they heard Minamitsu Murasa said they were going to Makai, whereas Sanae Kochiya who appeared confused, wasn't. This may be another reference to the PC-98. On Stage 6 of Undefined Fantastic Object in Hokkai, fairies will fly down towards the player in a similar fashion to Space Invaders. There is also a texture image in the background that resembles two Invaders. In the Phantasm stage of Perfect Cherry Blossom, Sakuya Izayoi makes a reference to Makai stating "Hell is not as scary as Makai"; this may hint that Sakuya has some relation with Makai, that she once visited here or she just happens to know about Makai. This page was last edited on 10 February 2016, at 11:41.